Another venomous attack on the Lincoln administration by the artist of "The Commander-in-Chief Conciliating the Soldier's Votes, no. 1864-31," and "The Sportsman Upset by the Recoil of His Own Gun," (no. 1864-32). 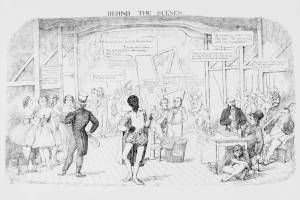 Here Lincoln and his cabinet are shown in a disorderly backstage set, preparing for a production of Shakespeare's "Othello."